Understanding how each immune cell type functions in the kidney is necessary to develop new immunotherapies for cell-mediated kidney diseases, including transplant rejection, AKI, and GN. Although CD4− CD8− double-negative (DN) T cells are a significant kidney T cell subpopulation that is anti-inflammatory and protective during ischemic AKI, little is known about the role of various MHC class I and II molecules in regulating their function. 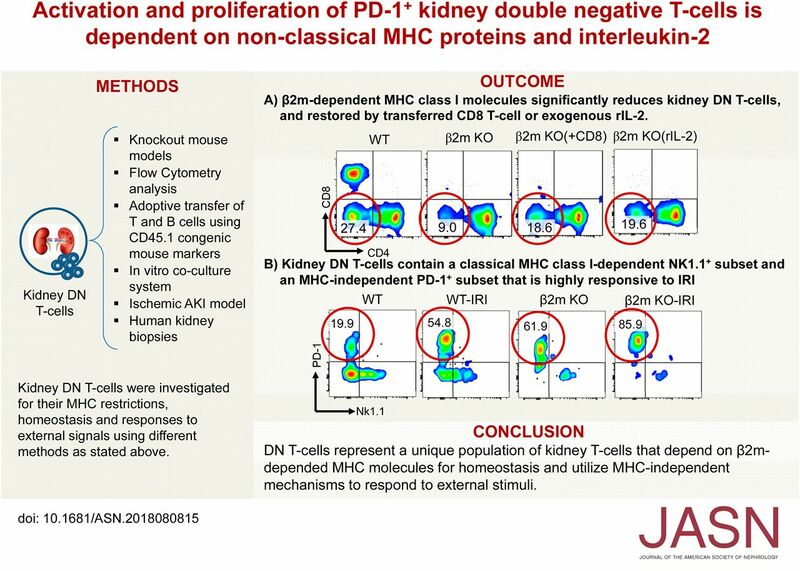 In addition to showing that mouse kidney DN T cells have IL-2–dependent proliferation, the authors identified two subsets of kidney DNT cells: a classical MHC class I–dependent NK1.1+ subset and an MHC-independent programmed cell death protein-1 receptor (PD-1+) subset that is highly responsive to ischemia-reperfusion injury. The presence of both subsets in human kidneys suggests that these findings are clinically relevant. Background CD4− CD8− double-negative (DN) αβ T cells with innate-like properties represent a significant component of T cells in human and mouse kidneys. They spontaneously proliferate in the steady state and protect against ischemic AKI. However, the mechanisms regulating DN T cell homeostasis and responses to external danger signals from “sterile” inflammation remain poorly understood. Methods We used knockout mice, functional assays, and an established ischemic AKI model to investigate the role of various MHC class I and II molecules in regulating kidney DN T cells. We also studied human nephrectomy samples. Results Deficiency of β2m-dependent MHC class I (but not MHC class II) molecules led to significant reduction in frequency or absolute numbers of kidney DN T cells due to impaired activation, proliferation, increased apoptosis, and loss of an NK1.1+ subset of DN T cells. The remaining DN T cells in β2m knockout mice mainly comprised a programmed cell death protein-1 receptor (PD-1+) subset that depends on IL-2 provided by conventional T cells for optimal homeostasis. However, this PD-1+ subset remained highly responsive to changes in milieu, demonstrated by responses to infused lymphocytes. It was also the major responder to ischemic AKI; the NK1.1+ subset and CD8+ T cells had minimal responses. We found both DN T cell subsets in normal and cancerous human kidneys, indicating possible clinical relevance. Conclusions DN T cells, a unique population of kidney T cells, depend on nonclassical β2m molecules for homeostasis and use MHC-independent mechanisms to respond to external stimuli. These results have important implications for understanding the role these cells play during AKI and other immune cell–mediated kidney diseases.